A bit off-topic, but does anyone know if the Gerdau(?) steel plant in Perth Amboy is open again? I think it closed about 5 years ago, but saw some posts that said it was open to supply something for the new Tappan Zee Bridge project, although maybe the posters mixed up the Sayreville and Perth Amboy locations. I guess that plant used to be (and hopefully still is?) served from Oak Island or Port Reading yard. The recession took a toll on the Perth Amboy plant. The melt shop was closed in 2006, followed by the rolling mill in 2009, leaving about 180 workers out of jobs, Quiring said. "It's a higher cost to operate in the Northeast," he said. "We tried to reduce costs and limit input, but with the recession demand dropped so much it wasn't viable to operate." Electricity is very expensive in NJ, driving most heavy industries out of the state, along with very high taxes. Nice link on the Gerdau Sayreville mill. Most rail cars going to the mill are gondolas loaded with scrap metal. However, some of the cars are flatcars with finger racks for holding steal rebar. Those cars run empty to the mill and return full. SA22 goes north out of yard on GIllespie Branch and then to Sayreville Runner to steel mill. OI16 is daily supply train for Browns yard, it comes down the Chemical Coast, across NJCL raritan bridge and runs west on the Amboy Secondary to Browns. I read that too that the Perth Amboy Steel Mill was to close, but it definitely looks active and has tanker cars and covered hoppers on site. Last edited by bigblue5277 on Wed Sep 03, 2014 9:04 pm, edited 3 times in total. 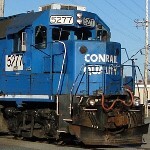 bigblue5277 wrote: Steel Mill Train (SA22) runs north out of the yard late afternoon / early evening five days a week. I've heard it runs Sun mornings too. Sometimes you can see it around 5 - 6 pm ready to leave the yard or see it getting assembled in the yard. Lately, I haven't seen this when passing by at 5 - 6 pm. so I'm thinking SA22 could be running earlier or later. If you have an afternoon free OI16 comes in from east M - F at 5 - 5:30 ish. SA33 departs west M - F at 5:30 - 6ish pm. Sometimes you can see SA33 waiting to leave west end of yard. You can try catching OI16 first, then SA33 second, all the while keeping an ear open to hear SA22 crossing Bordentown Rd. my experience is that SA22's run time is most variable, while OI16 is least variable. ChrisU wrote: Anybody know the schedule for the steel plant train? OK, so funny thing. You're question got me thinking maybe the steel mill train has been leaving Browns Yard early, before OI16 arrives. So I left work a little early, and there it was sitting in the yard. The train then promptly departed the yard a few minutes after 5 pm. Here's my thinking. If the steel train is big and heavy they wait for OI16 to arrive and use the SD locos from OI16 for the steel train. However, if the steel train is small, like today, they just use a couple GPs and leave the yard before OI16 arrives. Being that the economy still isn't good perhaps anticipate an earlier train with GPs (this is good as the days are getting shorter). Here's another exciting bit. No SPLAT car! Traditionally, the train would run up to the Sayreville wye and go west stopping before Jernee Mill Rd. It would then shove east to the Steel Mill. Not this time. The train ran straight to the steel mill reaching it in just 30 minutes. I'm thinking the mill must have a run around track now. Thanks for your question Chris. I hope this helps. bigblue5277 wrote: Nice link on the Gerdau Sayreville mill. Any chance rebar moves by train from Sayreville to Perth Amboy to be cut and bent there? One of the other links I saw referred to rebar "cages" coming from Perth Amboy, which does make me think that work on rebar is done there. Maybe OI16 could simply drop off those flatcars with finger racks of new rebar in Perth Amboy on its way back home from Browns Yard. Wishful thinking to be sure!! Would make sense though to this non-railroader. Chris , your inquiry on the steel mill train piqued my interest. Thanks to you I finally got the shot I've been wanting to get at the Main St. Ext crossing. I saw the steel train back in March running straight to the mill w/ locos in front, and now again this time as well. The mill must have opened a run around track, or perhaps has switchers on hand to handle the train once it arrives. Last edited by bigblue5277 on Fri Sep 05, 2014 9:19 am, edited 1 time in total. Nice shot, Jason. The Perth Amboy plant is served by Port Reading based local PR-8, which can run at anytime, but mostly in the mid to late afternoon, and they need permission from NJT to access it (161.2350 Mhz). RailsEast wrote: Nice shot, Jason. The Perth Amboy plant is served by Port Reading based local PR-8, which can run at anytime, but mostly in the mid to late afternoon, and they need permission from NJT to access it (161.2350 Mhz). I have never seen that happen, but I do not live in the immediate area. Thanks for the heads up guys and nice shot! Gonna give it a try today. What I presume was SA22 left Browns around 16:30 today and ran light with CSX 4405 only chased it to the wye. I intended to chase it all the way to the steel plant but I was confused I thought It may have been SA02 and then I saw it hook a left towards South Amboy but I wasn't sure if the west leg of the wye is in operation or not. I was never able to find it but I followed the line to the steel plant. I believe it went to the steel plant but it probably made it there before me because the train has a much more direct route. I'll post the photos later and I guess I'll have to try it again next week, wouldn't railfan if there was instant gratification! ChrisU wrote: What I presume was SA22 left Browns around 16:30 today and ran light with CSX 4405 only chased it to the wye. I intended to chase it all the way to the steel plant but I was confused I thought It may have been SA02 and then I saw it hook a left towards South Amboy but I wasn't sure if the west leg of the wye is in operation or not. I was never able to find it but I followed the line to the steel plant. I believe it went to the steel plant but it probably made it there before me because the train has a much more direct route. I'll post the photos later and I guess I'll have to try it again next week, wouldn't railfan if there was instant gratification! A lone geep sounds like it could of been SA2 running to pick up empties from Hercules (just east of wye) and/or Riverside Supply (just west of Jernee Mill Rd). SA2 usually runs early afternoon, but sometimes runs later afternoon. I've never seen an engine (esp. 1 geep) run light to the mill, not to say that it wouldn't happen. I look forward to seeing your picks and glad to hear you'll be trying again next week. Thanks that makes much more sense, how often does SA2 make it to Silverline windows or do they not run that far anymore? ChrisU wrote: Thanks that makes much more sense, how often does SA2 make it to Silverline windows or do they not run that far anymore? The train goes about once a month to Silverline. There's no schedule. When Silverline needs a new hopper of colored plastic pellets they make a call and the train runs out in the following days. Have you checked out the Raritan RR/Milltown News thread?